A picture really can be worth 1000 words. Our right brain is wired to recognize symbols and images in a split second and then correlate them with our knowledge base of meanings and significance to determine their importance to us. So it can be a powerful resource for us to intentionally choose or create a positive symbol that represents our own growth and healing. You can incorporate collaged images and words too if the image that you want to depict is difficult to draw. Magazines and images from the internet can be easily pasted down in your journal and added to with drawing or paint if you want to as well. With this image, I intentionally considered what symbol felt supportive and comforting for me at the time. I thought of the infinity symbol because I was focused on integrating different aspects of my life and for me this symbol represents this. So I began by just making slow figure 8 lines with alternating hands using water-soluble Portfolio Pastels. I love the creamy texture of them and the fact that they can be blended easily. I noticed that the motion was rhythmic and comforting and loosened up my arms and shoulders a bit. I intuitively selected the colors and kept going until the movement felt done. Then, as I looked at it, I immediately "saw" the compassionate eyes in each side, so I added these with regular oil pastels. Then I added the pearlescent acrylic spiral representing the 3rd eye of awakening. 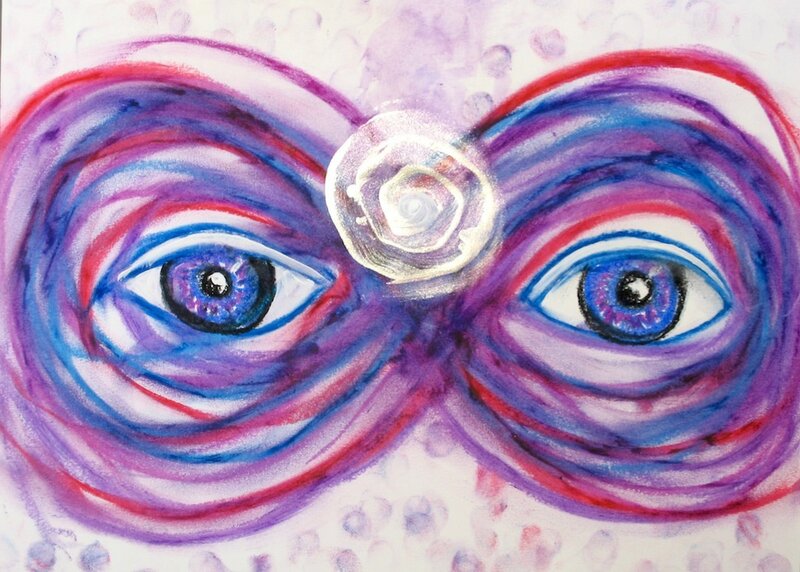 Over the years of painting and drawing I have realized how important eyes and faces have been for my own sense of relational healing, so they are a common symbol in much of my journaling and artwork. I find them comforting when I feel challenged or lonely, so I often have at least one on the wall where I see it often. Here are some more sacred symbols to give you inspiration. Often times the simpler the better to make it easy to create and quick to imprint in our mind and body.